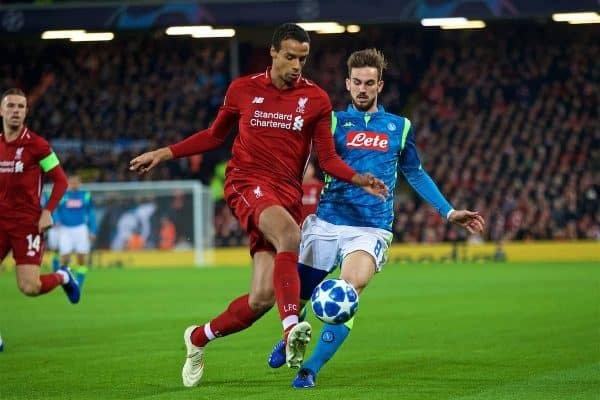 Liverpool host Napoli in the Champions League this evening knowing that a 1-0 win or a victory by two clear goals will see them reach the knockout stages. We’re live to bring you the latest. Kickoff at Anfield is 8pm (GMT), the referee is Damir Skomina from Slovenia. Henry Jackson is running today’s blog – get involved by tweeting your thoughts to @thisisanfield, @HenryJackson87 or via the comments below. Blog loads above; adblockers may need to be turned off. App users click here.